In May, when graduates of IINE’s Hospitality Training Program proudly collected their diplomas and celebrated the end of their course, they welcomed a guest speaker who inspired dreams of the paths their careers could take. Their graduation speaker was George Terpilowski, an immigrant who worked his way from front desk clerk to his current position of Regional Vice President of the Northeast U.S. Region for AccorHotels and General Manager of the iconic Fairmont Copley Plaza in Boston. While attending university in his home country of England, George worked at summer camps in Western Massachusetts for two years through the British Universities North America exchange program. During those summers he had the opportunity to hitchhike from coast to coast, and it was then he developed his view that the United States is a land of immense opportunity. At the time of George’s graduation the United Kingdom was in the midst of a deep recession, and to George, America “seemed like a country where you could do what you dreamed of doing,” and so he decided to move to the U.S. permanently. With his official paperwork in hand and a vague but hopeful plan to be part of the American dream, George moved to Washington, D.C. When he first arrived he had no connections at all but applied for a job in a hotel because he planned to work flexible hours, make a decent wage, and start taking night courses. He participated in the hotel training program and began working at the front desk of the Sheraton Washington Hotel. George says that at the time, he sensed he could start doing anything in the U.S., and that with enough hard work, he could succeed. For George, working for the first time in a hotel with 15,000 rooms felt essentially like being part of a small, insular town: it had a security force, an emergency response team, engineers and accountants, marketing people and chefs — huge numbers of people all working together to help make sure guests had a lovely experience. Today, as George walks the halls of one of Boston’s most historic and iconic hotels, he sees staff in the same position he was once in. He sees immigrants and young people just starting out their careers, who are eager to make their mark and get ahead. And from the other side of his career, he has the perspective of someone who has succeeded on his chosen path and wants to help others along the route he took. The Fairmont Copley Plaza is an employer partner of IINE’S Hospitality Training Program (HTP), which prepares students for employment in the hotel industry and includes a job-shadowing component where students work in hotels around the Boston area for four days. The majority of HTP graduates go on to gain full-time employment as server assistants or housekeeping staff. But they typically don’t stay at that level job for long. “This is an industry that is still ripe for people to come in at the very bottom of the totem pole, and if you have the right attitude, work hard, and really commit yourself…you have a chance of having a phenomenal career,” George said. It was the same theme he had highlighted in his speech to HTP graduates in May, when he urged those just starting in their careers to persevere and dream of bright futures. 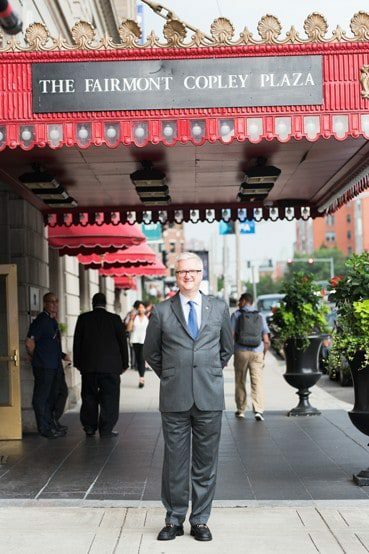 If George Terpilowski’s career trajectory is anything to go by, then it is clear that the hospitality industry rewards those who work hard and dream big. To learn about attending IINE’s skills training programs, please see: ine.org/job-skills-training-boston. For information about becoming an IINE employment partner, contact Saraugh Fitah (sfitah@iine.org).